Early spring flowers tell us that winter is nearly over. While cool-season annuals provide early spring color, most perennial flowers are just beginning to grow. We also think of Easter flowers when talking about planting spring flowers. To simplify your flower garden ideas, here are some easy-to-grow perennial flowers to include in your garden plans. Remember, perennials come back year after year... so place them where you'd like them to stay. Daylily - Height: to 1 ½ to 3 ½ feet. Daylilies are terrific because they need no maintenance; they are very easy to grow. They can be planted in full sun or partial shade. You can divide them in late summer and fall, and replant them! They bloom in all colors except blue and white. Geranium - Height: 6 inches to 1 ½ feet. 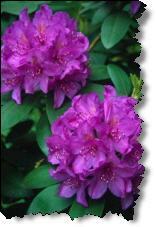 This hardy perennial blooms in late spring and summer. Flowers are pink, magenta and purple. These make wonderful edging flowers. They require no special care, and do well in sun and partial shade. They even grow well in poor soil. Hosta - Height: Up to 3 feet. If you have shady areas, hosta flowers are a perfect fit. The blooms are white, lavender or violet, and the foliage can be quite varied from solid green to yellow-gold. Some leaves are colorfully striped. Hostas are quite useful as ground cover under trees, in flower beds, and as edgings. These spring flowers can take hot, dry spells and can even survive poor soils. Locate Hosta flowers properly, and they'll last a lifetime. Iris - Height: 6 to 50 inches. Irises are easy to grow and come in many varieties. The beautiful blooms of these spring flowers appear from spring to early summer and will brighten up any garden plans. The most common and hardy iris plant is the tall bearded iris. Their magnificent blooms like the full sun, and their only demand is moist, well-drained soil. Shasta Daisy - Height: 1 to 4 feet. Need a season-long supply of flowering blooms? Shasta daisies are the perfect spring flowers. They have strong stems and can be planted in full sun or partial shade. Keep their soil moist and drained, and you'll enjoy these flowers from late spring through the summer months. Find climbing perennial flowers that will thrive if planted on a garden trellis! Perennial spring flowers remind us that its time to enjoy our gardens. To know the hardiness of perennial flowers to choose for your area, be sure to check your planting zones. Have you tried growing roses... but they didn't make it through winter? Would you like to grow perfect roses just like you buy from the florist? Find out everything you need to know about growing superb roses, the right way. Learn rose gardening from the experts... soon your yard will be brimming with the most beautiful of all garden flowers. And for your adventurous spirit... did you know there are many tropical flowers you can buy and plant in your garden? Find out which ones you can plant, right along with your spring flowers. Add a taste of the tropics to your flower garden ideas! Got critters in your garden? ...It's on-the-house, from your friends at Lawn-and-Gardening-Tips! Click here!